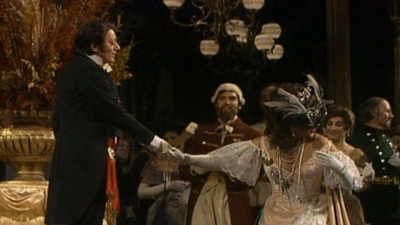 Eugene Ormandy conducts a distinguished cast in this English-language version of Johann Strauss’s effervescent operetta. Risë Stevens is sensational as the extravagant Prince Orlofsky, whose costume ball is at the center of the action. Richard Tucker sings Alfred, the luckless opera singer who is wooing his old flame Rosalinde (Marguerite Piazza) and is mistakenly hauled off to prison in place of her husband, Eisenstein (Charles Kullman). Patrice Munsel is Rosalinde’s maid, Adele, John Brownlee sings Dr. Falke, and Jack Gilford gives a hilarious performance as the jailer Frosch.